We’d love your help. Let us know what’s wrong with this preview of The Seven Deadly Friendships by Mary E. DeMuth. There's something wrong with your friendship, but you can't figure out why. Is everything in your head? Unfortunately, toxic friendships happen to everyone, but we seldom identify the underlying issues while we battle confusion or the friendship breaks up. Maybe you're left bewildered in the friendship's wake, paralyzed to move forward. After wading thro Friends for a Season? 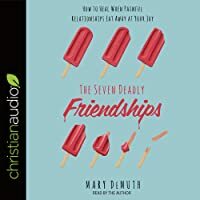 After wading through several difficult friendships, Mary DeMuth reveals the seven different types of toxic relationships and empowers you to identify the messiest relationships causing you the greatest anguish. Face the reality of your broken relationship, and unearth exactly what went wrong. Discover why you may attract toxic people. Heal from broken relational patterns so you can choose safer friends. Evaluate when it's time to press into a friendship or let it go. To ask other readers questions about The Seven Deadly Friendships, please sign up. Every single one of us has been in a toxic, unhealthy, "deadly" friendship. We have all been touched by hurt, pain, betrayal, envy, drama, some even abuse. And this book is a healing balm to the parts of us that have been broken by such relationships. This book is for each and every one of us. The book is broken up into two parts: chapters on each of the deadly friendships, and a section on healing from those friendships. The chapters breaking down each deadly friendship were absolutely FASCINATI Every single one of us has been in a toxic, unhealthy, "deadly" friendship. We have all been touched by hurt, pain, betrayal, envy, drama, some even abuse. And this book is a healing balm to the parts of us that have been broken by such relationships. This book is for each and every one of us. The chapters breaking down each deadly friendship were absolutely FASCINATING and eye-opening. (There is also a quiz to decipher what type of "deadly friendship" you are in on the author's website.) And it really helped me because I thought some relationships were a certain way, but I realized some of them were a mixture of a couple of the types of friendship. Although the one thing I wish was a little more discussed was how people can, in fact, be more than one of these relational types. Just like personality tests, where we are a mixture of those types, I feel like these deadly friendships are the same way. The second section on healing from those relationships was really great too. I love how the author shows that Joseph and Jesus were both faced with all 7 of these deadly relationships, and how they overcame them and healed from them. So, today, Mary released The Seven Deadly Friendships- How to Heal When Painful Relationships Eat Away at Your Joy. And y'all, read this & you'll see why I say Mary blew me away, again! We all have the friendships where you give more than you get. Or the one where someone twists every single thing back to them so that they are the main attraction, always. Whatever your issues, Mary touches on a great many of them. And she speaks about how to handle them biblically. It doesn't have to be some So, today, Mary released The Seven Deadly Friendships- How to Heal When Painful Relationships Eat Away at Your Joy. And y'all, read this & you'll see why I say Mary blew me away, again! We all have the friendships where you give more than you get. Or the one where someone twists every single thing back to them so that they are the main attraction, always. Whatever your issues, Mary touches on a great many of them. And she speaks about how to handle them biblically. It doesn't have to be something we rehash over & over in our minds, bugging us to death. Through this book, I've been able to identify what is wrong in the friendship, and biblically process and deal with the relationship. Sometimes, it's best to roll up your sleeves and get through it, even when it's ugly, and sometimes it's just time to cut it out of your life. Mary walks readers through all of this in this wonderful book. By the time you're finished reading and dealing with your problem relationships, you walk away with it off your shoulders, really being okay about whatever the outcome. I highly recommend this book to anyone! If you’ve ever found yourself staring at a trail of destruction left in the aftermath of a toxic relationship, wondering what just hit you, The Seven Deadly Friendships is for you. Mary DeMuth offers keen insights, hard-won wisdom, and—most importantly—a biblical perspective on the types of friendships that hurt us most and what to do about them. The Seven Deadly Friendships by Mary DeMuth is a book on the types of relationships that can harm us. Taken from her own experiences and Proverbs 6:16-19, Ms. DeMuth takes the reader through the different types of dangerous relationships, what to look out for and how avoid them. Part of the book covers the different relationships. The seven relationships are: narcissistic friends, unreliable friends, predatory friends, conman friends, tempter friends, fake friends and dramatic friends. She also The Seven Deadly Friendships by Mary DeMuth is a book on the types of relationships that can harm us. Taken from her own experiences and Proverbs 6:16-19, Ms. DeMuth takes the reader through the different types of dangerous relationships, what to look out for and how avoid them. Part of the book covers the different relationships. The seven relationships are: narcissistic friends, unreliable friends, predatory friends, conman friends, tempter friends, fake friends and dramatic friends. She also encourages the reader to look at themselves to evaluate if they behave like any these types and offers suggestions to change and avoid these behaviors in the future. Part 2 covers how to move forward, find healthy relationships and gives Biblical examples to encourage and support the readers and he or she strives to change. She offers seven life-giving practices to ensure we are in healthy relationships on everyone’s part. From reviewing the past for patterns of behavior to avoid the behaviors which hurt us and ways to move forward in healthy relationships. The Seven Deadly Friendships was suggested to me in an email from a publisher I subscribe to. The premise was interesting, so I ordered it. The book was an easy and quick read as I was able to finish it in one day. It’s short only 200 pages but the information is valuable and worth reading. We have all come in contact with individuals who may fit these categories. Whether these individuals are family, friends, co-workers, etc, this book can help you recognize unsafe people and gives strategies how to deal with them if they are people that you must interact with. Ms. DeMuth is very forthcoming and honest about her past experiences with these individuals and offers other people’s experiences. I especially like the parts in which she has the reader evaluate if they have behaved this way in the past or even behaves in these unsafe behaviors in current relationships. She offers strategies on how to deal with moving forward and seeking help, if necessary. If you are looking to improve your relationships with people around you, the first book I recommend is Boundaries by Drs. Cloud and Townsend. The second one is this book. a person who sows discord in a family. The author attempted to break the book into seven deadly friends but it was sometimes difficult to keep straight because so many of the characteristics were repeated. I appreciated the stories of persons who talked about their “deadly friendships” but did come away with a good handle on how to heal from these types of friendships. The oft-repeated advice was “stay away”. This is good advice, but it doesn’t help me to deal with the issues I already have because of past deadly friends. Quote: The best way to think logically about someone enslaved to narcissism is to look at his or her fruit. Jesus said, “You can identify them by their fruit, that is, by the way they act. Can you pick grapes from thornbushes, or figs from thistles?”(Matthew 7: 16). Even by looking at a narcissist and their fruit, we have to be cautious and discerning. Matthew 7:16 was lifted out of its surrounding context and made to fit the situation. To someone who’s not familiar with the Bible, it would seem as though Jesus spoke out against narcissistic people and not false prophets. In my opinion, the same passage could have been used by comparing the narcissist to a false prophet. Quote: Jesus also reminds us to be frank, to mean what we say and say what we mean. He said, “Just say a simple, ‘Yes, I will, ‘or ‘No, I won’t. ‘Anything beyond this is from the evil one” (Matthew 5: 37). If you cancel on a friend using an excuse (instead of the truth), you’ll be training yourself to be unreliable. Let your words mean what they say. Don’t fear people so much that you have to make up stories and excuses to say no. Neither shalt thou swear by thy head, because thou canst not make one hair white or black. Quote: Tempter Trevor will lead you where you don’t want to go. In your rational state, you may say to yourself that you’d like to obey God and live a life that makes him smile, but in the moment with your tempting friend, you suddenly become the person you know you don’t want to be. Violent people mislead their companions, leading them down a harmful path (Proverbs 16: 29). They are the worst kind of rebel, full of slander. They are as hard as bronze and iron, and they lead others into corruption (Jeremiah 6: 28). O daughter of my people, gird thee with sackcloth, and wallow thyself in ashes: make thee mourning, as for an only son, most bitter lamentation: for the spoiler shall suddenly come upon us. They are all grievous revolters, walking with slanders: they are brass and iron; they are all corrupters. Quote: We see this play out in Jesus’s life at the Passover supper before his betrayal and crucifixion. He literally dined with those who would desert and betray him—the deadliest of friends. Yet he feasted. He poured himself out. He fed his friends, washed their feet, prayed over them. He provided comfort, all the while knowing that in a few short hours, their sins would be forced upon his back. If he can feast in the midst of that kind of strife, we can too. So my prayer for you as you close this book is this: May you be feasting. The Passover wasn’t a feast. It was a reminder of the night when the angel of death visited all the families in Egypt and killed all the firstborn that were not covered under the blood. Jesus was the perfect Lamb. He didn’t feast. He ate the Passover meal because He was the lamb who would be slain the next day (Exodus 11:1-12:30). The disciples’ sins weren't "forced on his back", He willingly took them on. The word force suggests that it was done to Him against His will. If Jesus didn’t willingly take on the sins of the world, then we’re not really saved. Only a willing sacrifice could have saved us from the punishment that we deserved. There are other examples that I could have included but I didn’t want this review to be too long. There is some knowledge to be gleaned from this book, but I would recommend reading it with your Bible close by so you can check the references. Run, don’t walk. Get this book preordered. I can not recommend it enough. As a member of Mary DeMuth’s launch team I was given a prerelease copy of this book to read - I had no idea it would rock my world and soothe my battered heart the way it has. Mary prays for her readers daily. Knowing I was being prayed for as I read the book just felt good. Here is a tiny excerpt from the intro. I’ll post more over time but this is just beautiful. “My hunch is that you picked up this book because of a cru Run, don’t walk. Get this book preordered. I can not recommend it enough. “My hunch is that you picked up this book because of a crushed spirit. Someone you thought would be there forever, a friend who morphed from ally to adversary, has wounded you. You’re living in the pain of that betrayal, and you want to make sense of it all, learn from it, and find healing. So before you turn the page to chapter 1, where we dive headlong into the first deadly friendship, do you mind if I pray for you? As beings who are created for authentic community, some of our deepest hurts can be traced back to instances where community wasn’t practiced in healthy ways. In Mary DeMuth’s latest book, The Seven Deadly Friendships, she takes us on an eye-opening journey through Proverbs 6:16-19. Readers will find healing, courage, and gentle conviction as she paints pictures of seven “friends” who practice the very behaviors the Lord hates. In the first portion of the book, Mary begins each chapter with a ch As beings who are created for authentic community, some of our deepest hurts can be traced back to instances where community wasn’t practiced in healthy ways. In Mary DeMuth’s latest book, The Seven Deadly Friendships, she takes us on an eye-opening journey through Proverbs 6:16-19. Readers will find healing, courage, and gentle conviction as she paints pictures of seven “friends” who practice the very behaviors the Lord hates. In the first portion of the book, Mary begins each chapter with a character analysis of what these “friends” act like, before providing real life examples, Scriptural insights, and personal application. Narrowing in on the lives of Joseph and Jesus, the second portion of the book is focused on how to find health after acknowledging the toxicity we may have allowed in our lives…or are practicing ourselves. As a long time fan of Mary’s writing, this book did not disappoint. I have always found her words to be “gracious and seasoned with salt”. Her transparent soul has a way of bringing encouragement and conviction in a gentle way. One of the ways this book is set apart from other similar books on toxic relationships, is it invites readers to examine themselves to see if there is “any offensive way in them”. Mary also acknowledges the sacrificial nature of continuing to love others after they have wronged us, while still maintaining boundaries and learning when separation is appropriate and needed. I would thoroughly recommend this book for anyone. I know it will bring courage and healing to many! I was able to preview an advanced PDF copy of this book. I was first attracted by that cover, then the title. Mary has taken the seven deadly sins and broken them down to describe "The Seven Deadly Friendships" that one could encounter in their lifetime. These relationships don't have to be friendships. They can describe a parental relationship, a romantic relationship, a work relationship. The list goes on. If you've lived to be twenty years old, you've encountered at least one of these difficu I was able to preview an advanced PDF copy of this book. I was first attracted by that cover, then the title. Mary has taken the seven deadly sins and broken them down to describe "The Seven Deadly Friendships" that one could encounter in their lifetime. These relationships don't have to be friendships. They can describe a parental relationship, a romantic relationship, a work relationship. The list goes on. If you've lived to be twenty years old, you've encountered at least one of these difficult and sometimes toxic relationships. Some people attract more than their fair share based on past experiences. The cycle just can't seem to be broken. Mary will help you pinpoint these relationships and then give you practical advice on how to repair damage to the relationship or to walk away if that is what is best for you. She uses stories from the Bible to better describe these situations. You'll learn warning signs of each type of deadly relationship such as Narcissistic Nolan, Unreliable Uma and Dramatic Drake. All hope is not lost. Don't let the title scare you. Many relationships can be repaired and healed when all parties are willing. But if they can't be, this book will help with that too. Mary DeMuth has once again sent out powerful words into the world. Anyone who's experienced a strained relationship with a friend or family member can find wisdom and encouragement from "The Seven Deadly Friendships." There are specific chapters that set out problematic friend archetypes to help readers determine which friendship they are facing. Each chapter proceeds into areas some rarely talk about, a skill Mary deftly uses in all of her books. Being ready to face the challenge of one of thes Mary DeMuth has once again sent out powerful words into the world. Anyone who's experienced a strained relationship with a friend or family member can find wisdom and encouragement from "The Seven Deadly Friendships." There are specific chapters that set out problematic friend archetypes to help readers determine which friendship they are facing. Each chapter proceeds into areas some rarely talk about, a skill Mary deftly uses in all of her books. Being ready to face the challenge of one of these "seven deadly friends" gives the reader an opportunity to evaluate the present relationship, identify past relationships that were rife with trouble, and find ways to leave said friendships in a healthy, God honoring way. She also offers self reflection in the fact that perhaps, we, too have been a 'deadly friend' once and a while in our dealings with others. She uses the second half of the book to show us two major examples of people from Scripture who faced true relational issues-- Joseph and Jesus (along with Paul, John and a few others.) While a book of this type could be seen as a depressing topic, Mary does not leave you in the midst of struggle or strife. She offers Scriptural supports, encouragement and suggestions from counselors and other authors who excel in relationship building or repair. There are many resources notated that the reader could seek out if more discussion or help is needed in the future. Mary does what she does best: raw, authentic, introspective writing that continues to deliver hope, even in the midst of challenging circumstances. We do not have to be held hostage to other people's bad behavior, but that also doesn't eliminate ourselves as possibly being the type of friend that needs a reboot in order to be a better friend. I received a PDF copy to review. All opinions are my own. Mary DeMuth does a great job examining the toxic relationships we have all experienced. She skillfully identifies the various characteristics of these friendly foes. Then shares biblical wisdom and powerful insight to help heal from the pain and devastation caused by these deadly friends! Mary DeMuth offers hope and healing to the hurting in The Seven Deadly Friendships. It sounds trite, but it’s true. The book’s convenient organization makes for easy reading, which helps balance the heavy nature of the topic. Each chapter of the first part contains the same sections: introduction, character traits, example stories, what the Bible says, what if this is me? Mary sprinkles hope throughout the entire book and focuses on healing in the second half. She wisely and beautifully points th Mary DeMuth offers hope and healing to the hurting in The Seven Deadly Friendships. It sounds trite, but it’s true. Mary sprinkles hope throughout the entire book and focuses on healing in the second half. She wisely and beautifully points the hurting to Christ and also offers some practical advice. This is definitely a book you will want to make up and come back to multiple times. This book could not have come to me at a better time. Mary explains several types of friends that have toxic tendencies. The second half of the book offers a biblical perspective of these same types of situations. There is a lot of good information on healing and overcoming the impact of negative friendships in an easy to understand fashion offered in this book. I did receive a pdf copy to review. This review is my own reflection. This book outlines 7 different toxic relationships and how to spot them, scripture on how to handle each of them and how to be victorious. I love that she shares about the toxic relationship of people in the Bible and how God still uses them for his glory. Great book, I highly recommend! What Did I Learn about The Seven Deadly Friendships? Oy! Where do I begin? You see, this book doesn’t just say, “Nervous Nellie (not a real friendship type) isn’t healthy because she is encouraging you to sin by being anxious.” Honestly, if I hadn’t heard Mary DeMuth speak on the topic of her book, I might not have bought it because that is the assumption I would have made. I would have been wrong—so very wrong. With kindness, compassion, and firmness without condemnation, Ms. DeMuth takes us bit b What Did I Learn about The Seven Deadly Friendships? No, first she introduces the type of friend and uses personal stories and other anecdotes to illustrate how that might look in your life. Rather than the canned, written-to-prove-a-point stories that so many non-fiction books employ, Ms. DeMuth either uses actual stories as she claims (shocker, I know), or uses her skills as a novelist to make them reasonable and realistic. I tend to assume the former. What can I say? I’m an optimist. But The Seven Deadly Friendships doesn’t stop with identifying why your friendship is a mess or ended so badly. She moves from understanding the type, to identifying the problem, considering a solution, and looking at the friendships through a Biblical lens. How are we to respond Biblically to this. Finally, she points the finger back at you. Are you this type of friend? And that’s why I bought the book, of course. I wanted to be certain that I was not the very person I’d just read about. For the curious? One didn’t stand out to me. Like with most tests and things to help unbox my psyche, this one showed me a nice, even, a little bit of everything kind of person. I’m just all around messed up. I could have told you that before I read The Seven Deadly Friendships but it was kind of cool to see how I’m messed up—specifically. And it was also nice to see that when I’ve chosen to step away from unhealthy relationships, I wasn’t unChristlike. How I did it may or may not have been. But as I’ve been learning over the last decade or so, there is nothing loving about encouraging a brother or sister in Christ in their sin by allowing them to perpetuate it… on you or anyone else. Recommended for anyone who wants to understand the hurt and turmoil around them or in their lives. The book is well-written, not “verse-picked” or “proof-texted.” It’s meaty with everything you need to know to understand the topic and yet an easy read. If you have a friend who seems to attract toxic relationships, or if you are that person, I highly recommend The Seven Deadly Friendships. Would you like to know if you or your friend exhibits traits of one of the seven deadly friendships? Take Mary's Quiz at marydemuth.com/deadly. I did it both with myself and someone with whom I've had conflict recently. I found it enlightening. What a powerful read! Mary DeMuth writes as though she's peering over your shoulder into your life and seeing the good and bad. But she offers empathy, gentle correction and scripturally-sound direction. When I started The Seven Deadly Friendships, I expected to just read about people who had hurt me and learn techniques about how to get past the betrayal and pain. I was definitely able to apply her teaching and stories to current and past relationships. However, the amazing thing was, I saw just What a powerful read! Mary DeMuth writes as though she's peering over your shoulder into your life and seeing the good and bad. But she offers empathy, gentle correction and scripturally-sound direction. When I started The Seven Deadly Friendships, I expected to just read about people who had hurt me and learn techniques about how to get past the betrayal and pain. I was definitely able to apply her teaching and stories to current and past relationships. However, the amazing thing was, I saw just as many—if not MORE—things about my own life that needed the Lord's gentle correction. After reading about my tendencies and fallback habits, I can analyze my role in various relationships and become a more loving and supportive friend. Some people don’t even recognize the toxicity of a bad relationship. They fool themselves because they allow a “friend” to walk all over them or dismiss their relationship when time is limited or the so-called friend doesn’t think they have the bandwidth to support the needs of the one who’s hurting. These folks will really benefit from The Seven Deadly Friendships. 1. Most people, particular parents, know someone, like their child, who needs this book to help them navigate a difficult relationship. 2. Others need it like I did—to see tendencies in their own lives that need to change to have deeper, more fulfilling connections with those they care about. 3. The final group would be those who have yet to walk this road but will someday. Informed people react with greater understanding and strength with any challenge of life. I highly recommend The 7 Deadly Friendships to any of the people mentioned above, as well as those who currently struggle with a difficult relationship. I did receive an advanced copy of this book, but I’ve purchased it willingly as a resource to help others. Toxic friendships eventually blow up, and the shock waves of relational chaos often send the wounded friend into isolation, delaying the process of healing. Mary DeMuth wakes us out of this stupor. "What wounds you is what heals you." Those healthy long-term friendships that we desire don't just magically happen. They are born out of fighting through fear, facing our own toxic relating styles, and trusting God through the pain. This author shows us how to identify toxic relationships and offers Toxic friendships eventually blow up, and the shock waves of relational chaos often send the wounded friend into isolation, delaying the process of healing. Mary DeMuth wakes us out of this stupor. "What wounds you is what heals you." Those healthy long-term friendships that we desire don't just magically happen. They are born out of fighting through fear, facing our own toxic relating styles, and trusting God through the pain. This author shows us how to identify toxic relationships and offers an invitation into grace to seek forgiveness and walk a healing path. Part one of the book helps the reader identify the seven deadly friendships based on the seven deadly sins found in Proverbs 6:16-19. Part two helps the reader move toward relational health through seven life-giving practices. In this section, I found this revelation that demanded a response. "What is familiar is what entices us, which is why we must unpack our why-why do we gravitate toward those who hurt us? Who do they remind us of? What story are we trying to complete? And how can Jesus fill the broken, needy parts of us so we don't keep pursuing the same deadly friendships?" That's why this book is so important. It doesn't stop at identifying toxic relationships, it shows us how to deal with them, forgive, look back in order to move forward, be truthful about our own failings, heal, trust God in the midst of the pain, and not stop pursuing healthy community. I can’t recommend this book enough! As I read “The Seven Deadly Friendships,” I kept thinking one thing over and over: This message of this book is so important. Living in a fallen world, we are bound to have deadly friendships—and they never leave us the same. And as the Mary DeMuth points out, Christians are not immune to destructive friendships—in fact, sometimes we are more susceptible to them because of our desire to show grace. Toxic friendships are a tactic of the enemy to create destruct I can’t recommend this book enough! As I read “The Seven Deadly Friendships,” I kept thinking one thing over and over: This message of this book is so important. Living in a fallen world, we are bound to have deadly friendships—and they never leave us the same. And as the Mary DeMuth points out, Christians are not immune to destructive friendships—in fact, sometimes we are more susceptible to them because of our desire to show grace. Toxic friendships are a tactic of the enemy to create destruction in our lives, churches, and even threaten to sabotage healthy relationships. This book is a must-read for all who want to heal from past hurts, guard ourselves against future toxic relationships and consider whether we ourselves are deadly friends. "The Seven Deadly Friendships" is easy to read, well-structured and biblicalyy-based. The author guides the reader through identifying deadly friendships (based on the biblical seven deadly sins found in Proverbs 6), and how to respond to these relationships biblically while pointing us to the ultimate Healer, Jesus. I loved the fact that Mary never lost sight of biblical truth; and her honesty about her struggles with her own deadly friendships—even admitting the times when she’s been a deadly friend to others. Another benefit of this book: It will give you a new appreciation for your healthy, life-giving friendships—they are God’s blessing to us! I am in a unique season of life. We recently moved halfway across the country. I've had some unique health and personal challenges in the last few years. I've seen another side of friendships I never knew existed. Through my trials I have discovered a lot about the people I thought were friends. I discovered a lot about myself and the kind of friend I am. This book comes into my life at the perfect time. We're in an unprecedented time in history. Thanks to Social Media, we are more connected tha I am in a unique season of life. We recently moved halfway across the country. I've had some unique health and personal challenges in the last few years. I've seen another side of friendships I never knew existed. Through my trials I have discovered a lot about the people I thought were friends. I discovered a lot about myself and the kind of friend I am. This book comes into my life at the perfect time. We're in an unprecedented time in history. Thanks to Social Media, we are more connected than ever. And yet we're so horribly disconnected. Something I hear people say constantly is "I don't know how to make friends" or "I'm not even sure who my real friends are." This book helps immensely. Mary has done an excellent job. Not only is this book easy to read, it makes so much sense. I love the easy-to-follow bullets under each "deadly friendship." Not only that, she gives us great tips to understand if WE are any of those types of friends. As I navigate this new season of life, and build new friendships in my new town, I am incredibly grateful for this book. I think it would be a beneficial read for anyone who feels like they haven't been able to *get* the friendship thing. Or anyone who has been wounded by a friendship and either need healing or doesn't quite know "what went wrong." Proverbs: A wise man will hear and increase in learning, and a man of understanding will acquire wise counsel. Toxic is all around us. Hurting people hurt people. Mary gives personal examples of friendships gone wrong. I like this piece of advice she gives: Help me to be gutsy and bold enough to share my pain story with someone. And give me a quiet heart to listen when they pray and offer counsel. The first part is easy, the second, not so much. There is so much good information in this book. It gi Proverbs: A wise man will hear and increase in learning, and a man of understanding will acquire wise counsel. There is so much good information in this book. It gives a step-by-step process of how to deal with situations that may frustrate you. Because to be real, the people around us can be difficult. The question that arises is, "is it me or is it them?" Mary helps answer that question and gives answers. Packed with wisdom from the greatest source on earth, the Bible, makes this a life-changing book. I received a copy of this book from NetGalley for my unbiased review. In "The Seven Deadly Friendships", DeMuth breaks down the seven types of toxic relationships she has encountered in her life. The descriptions of each of them are very thorough and detailed. You can tell she did her research! It really opened my eyes about some of my past relationships and hurts. She details each of them in a way that doesn't demonize any of them, yet still shows their danger. I loved that she had real-life exa I received a copy of this book from NetGalley for my unbiased review. Adult friendships can be so difficult, and this timely book offers tools to discern why that might be. I love Mary's humble heart that not only identifies the extremes of each "deadly" friendship she addresses, but the subtle ways dysfunction and sin can creep into our own hearts. Her honesty and vulnerability makes this a tender book, pointing back to Jesus and the hope he offers us for healing from friendship wounds, and forgiveness for the wounds we inflict to our friends. Mary is a prayerful Adult friendships can be so difficult, and this timely book offers tools to discern why that might be. I love Mary's humble heart that not only identifies the extremes of each "deadly" friendship she addresses, but the subtle ways dysfunction and sin can creep into our own hearts. Her honesty and vulnerability makes this a tender book, pointing back to Jesus and the hope he offers us for healing from friendship wounds, and forgiveness for the wounds we inflict to our friends. Mary is a prayerful, gentle teacher, and this book is a powerful one. I was convicted and encouraged as I read. HIGHLY recommend this to anyone in relationship with other people. In a culture where intimate, face-to-face community has to be more intentionally pursued, this book is timely and entertainingly instructive. Mary DeMuth includes tons of vulnerable and relatable stories of her own friendships that help identify possible toxic relationships you might be involved in. But what I love the most about this book is the hope it communicates. After discovering tendencies of a couple of these friendships not only in a friend but in myself, I was pleased when Mary served In a culture where intimate, face-to-face community has to be more intentionally pursued, this book is timely and entertainingly instructive. Mary DeMuth includes tons of vulnerable and relatable stories of her own friendships that help identify possible toxic relationships you might be involved in. But what I love the most about this book is the hope it communicates. After discovering tendencies of a couple of these friendships not only in a friend but in myself, I was pleased when Mary served up redemption and healing in Part Two of the book. Her Biblical examples of healthy relationships and her helpful practices for navigating today's friendships were a breath of fresh air. This is a must read for anyone wanting to be a healthy friend and to grow life-giving relationships. I grew up with narcissism. Then, I married a narcissistic man. Mary Demuth explains why this is in her book The Seven Deadly Friendships. The answer is that I never healed, so I sought out my "normal". Normal is comfortable even when it is unhealthy. In this book, Demuth describes seven unhealthy friendships, but this could, also, be seven unhealthy dating relationships and business relationships. She gives examples, characteristics, and Biblical advice. I love how quickly this reads. It is very c I grew up with narcissism. Then, I married a narcissistic man. Mary Demuth explains why this is in her book The Seven Deadly Friendships. The answer is that I never healed, so I sought out my "normal". Normal is comfortable even when it is unhealthy.